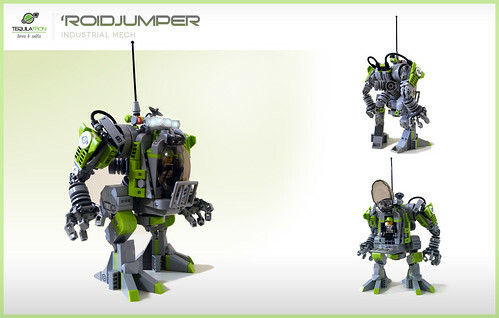 Tequilatron's all purpose medium mech 'Roidjumper is the working horse of the company. Used for heavy lifting, construction works and transportation of goods. Its jetpack and feet nozzles allow it to travel freely through zero- and low gravity space. The working pilot sits safely within a centered climatized cage construction. This build is part of an online collaboration called Mining Frenzy, which can be seen here on Flickr and Mocpages.